What difference can early education make? Helping one young child learn to read or master early math skills can unlock infinite possibilities for her future. At Age of Learning, we believe high-quality early learning can have a meaningful, lasting impact on every child’s life. 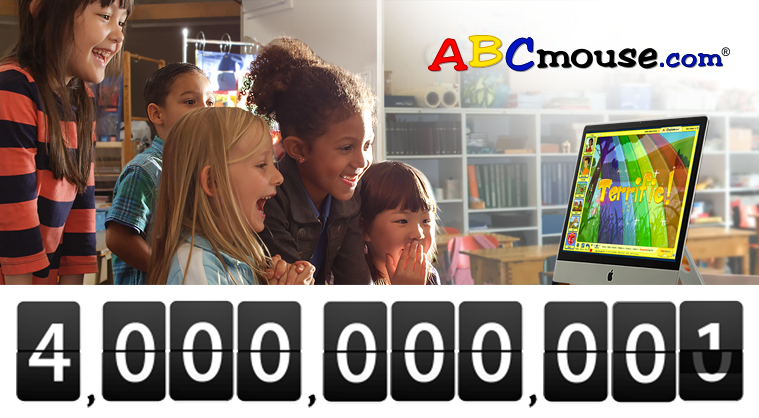 So we’re excited to announce that our flagship program ABCmouse has helped educate more than 18 million children, who have completed over 4 billion learning activities and counting, including books, games, puzzles, animations, and art activities. We’ve heard from many of the millions of ABCmouse parents and teachers about the positive impact ABCmouse has on young learners’ academic skills and love of learning. But it’s not just anecdotal. A dozen research studies, including several large-scale randomized controlled trials conducted by leading education researchers, show that ABCmouse accelerates learning and helps children make significant gains in early literacy and math skills with as little as 30 minutes of usage per week. Across the globe, children are learning to count, understand their letters, and become strong readers on ABCmouse. And, just as importantly, they are having fun! In ABCmouse they can explore the natural world, keep dinosaurs and unicorns as pets, race cars, solve puzzles, and read adventures tailored for their age and interests. Through play, they do some serious learning! More than 4 billion learning activities completed is an exciting milestone. But we won’t stop here—we are committed to continuing to expand, enhance, and increase access to our educational programs. ABCmouse is available to families on a low-cost subscription basis and is free in classrooms, public libraries, public housing authorities, and other community centers as part of our Education Access Initiatives. These initiatives have helped educate more than 6 million children across all 50 states, at no cost to families, teachers, or libraries. If educating one child can make a difference to her and all the people she will influence throughout her life, imagine what could happen if every child had that opportunity. At Age of Learning, we are committed to making that a reality, one book, game, and puzzle at a time.